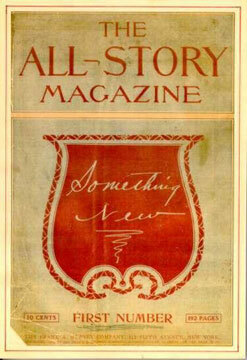 In January 1905, Frank Munsey, originator of the all-fiction magazine, sought to capitalize on the growing popularity of the format by releasing a second pulp title, All-Story. 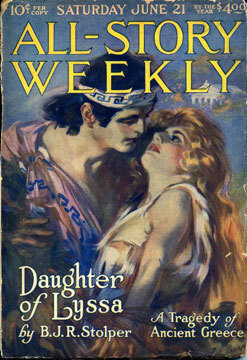 Becoming a weekly in 1914 and absorbing Cavalier later that year, the magazine would run until 1920 when it was itself absorbed into the Argosy, but not before it had published some of the most innovative and memorable fiction the pulps ever produced. The magazine's most famous contributor arrived in February of 1912 when the first installment of Edgar Rice Burroughs's serialization Under the Moons of Mars appeared under the pseudonym Norman Bean. Burroughs came to the Munsey pulps in 1911 a frustrated business man attempting to begin a new career in fiction writing at the age of thirty-six. 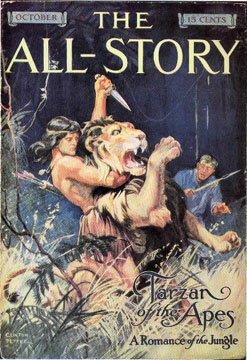 With the help of All-Story editor Thomas Newell Metcalf, Burroughs revised his original Mars manuscript and it was accepted for publication, inaugurating a relationship with the magazine that would oversee the publication of many of his most popular stories, including Tarzan of the Apes in October of 1912. Other prominent contributors were Rex Stout, who published many of his early works in All-Story, and Johnston McCulley, whose Zorro character made his first appearance in the August 9th, 1919 issue. Although All-Story is remembered for its adventure stories, it was typical of first generation pulp magazines in that it printed a range of fiction, including tales emphasizing mystery, suspense, romance, and western or exotic settings. Bookended by fairly brief sections for advertisements, a typical issue contained five or six serialized stories followed by a single novelette and another five or six short stories. The editors usually made room for poems between stories and concluded each issue with a section entitled "Table Talk" and, later on, "Heart to Heart Talks" that included updates about the magazine and letters to the editor. Burroughs, Edgar Rice, Alexei Panshin, Cory Panshin, and Paul Cook. A Princess of Mars. Rockville, MD: Phoenix Pick, 2010. Robinson, Frank M, and Lawrence Davidson. Pulp Culture: The Art of Fiction Magazines. Portland, OR: Collectors Press, 1998. _____. “The Story Behind the Original All-Story.” Zoetrope: All-Story 4.1 (Spring 2000): 55-56.